Counties use various strategies to devise new taxes and get voters on board with them. Nobody enjoys paying taxes, yet they are a key method counties and cities use to fund civic projects. When local governments decide to propose new or increased taxes, they often use several strategies to seek public input and outreach public education to win voters over to the idea of them. Such campaigns can be daunting, especially when projects don’t directly impact most citizens. Wake County, N.C., faced this issue when it sought to pass a half-cent sales tax increase to fund a 10-year plan to triple bus service and add 37 miles of commuter rail throughout the county. Increasing Wake County transit had been discussed for about 15 years, and in 2009 the North Carolina state legislature authorized the counties of Wake, Durham and Orange to institute voter-approved sales taxes to help fund regional transit, according to Hutchinson and county data. County officials took about 15 months starting around mid-2014 to revamp its transit plan through a consultant-driven, public process, Hutchinson says. About 80 Wake County citizens representing many interests were brought in to work with consultants to design the plan, while “hundreds” of public meetings and hearings were held about the plan, he says. The planning committee was made up of professionals in business, environmental matters, unions, the AARP, real estate and the homebuilders association. “It was an extremely transparent and extensive public process in designing this plan,” Hutchinson says. The county used information gained from these meetings and hearings in creating the new transit plan. In June 2016 the county approved the plan and put the sales tax on the ballot, according to advocacy group Moving Wake County Forward. Hutchinson acknowledges that advocacy and education efforts organized largely by the Raleigh Chamber of Commerce — with no input from the county — helped communicate information to the public. However, county employees visited numerous groups to educate citizens about the transit plan. Ten out of Wake County’s 12 municipalities endorsed the tax; while the two others opted not to endorse the tax, they were not opposed to it, Hutchinson says. While some local taxpayers organized opposition to the tax, it scored a slim victory in November with 53 percent voting yes and 47 percent voting against, according to Hutchinson. The tax was set to be implemented on April 1. Johnson County, Kan., officials faced similar issues while seeking funds to build a new courthouse and coroner’s facility in 2016. “One of the biggest issues we had to face is that 97 percent of our population never see or never visit the courthouse,” says Ed Eilert, chairman of the Board of Johnson County Commissioners. “So in order to educate that 97 percent of our population, which needed to approve this action… that was our biggest challenge,” he says. County officials had discussed the need for a new courthouse and coroner’s facility since the early 2000s. 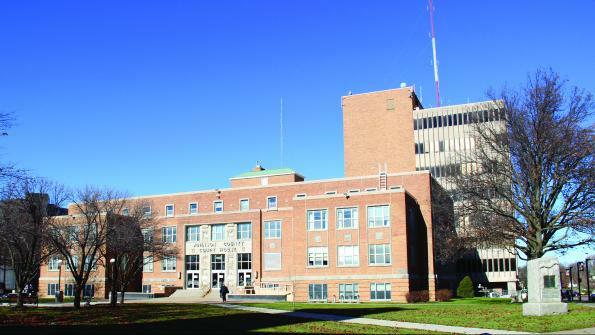 The over-60-year-old courthouse had numerous external and internal problems, and the county had also been using a private, outdated coroner’s facility. Public inputs had been taken and several plans proposed during this time. A 15-member citizens’ advisory committee consisting of professionals and members of the general public was formed for the project in 2014, Eilert says. This group looked at information the county provided and presented several proposal options to the county commission. The county made the issue a priority to be funded in 2015. Being part of the Kansas City metropolitan area, 22 percent of Johnson County’s sales taxes are collected from visitors outside the county, Eilert says. That fact combined with feedback from six public input sessions held around the county in early 2016 indicated that the public preferred sales tax funding over property tax funding, according to county officials. Having previously secured state legislature authorization for a 10-year, voter-approved, quarter-cent sales tax increase for public safety funding, the county approved a measure for using the tax to build a new courthouse and coroner’s facility to appear on the November ballot in May 2016. At these gatherings, officials presented measure-related documents and a 10-minute county-produced video that highlighted issues with the courthouse and private coroner’s facility, Eilert says. “People had no idea how those [coroner-related] activities work, and when they understood the type of facility that we had to operate in, they were ready to support the coroner’s facility,” Eilert says. Utilizing the courthouse itself proved key in the measure’s victory, according to Eilert and county data. In addition to the video, county employees gave several tours of the current courthouse and held courthouse open houses and public hearings that all showed the building’s issues. County officials relied on a website and social media to spread information, too. “What we tried to do is put [the campaign] in terms of, we’re trying to serve the public and the needs of the public, and that was the reason for this campaign,” Howe says. Ultimately, the November vote was a close victory — 53 percent voted yes, while 47 percent voted against it, Eilert says. The tax was implemented on April 1, and construction of both buildings is anticipated to begin in 2018. Even when a tax is proposed to fund an item used by most residents, public input and education campaigns sometimes aren’t enough to influence taxpayers’ votes in favor of new taxes. Such was the case when, in November, Clackamas County, Ore., voters shot down a seven-year, 6-cents per-gallon fuel tax to fund maintenance for Clackamas County’s nearly 1,400 miles of county roads. Clackamas County has no independent means of road maintenance funding, and Oregon law forbids counties from using property tax revenues to fund road maintenance, according to Clackamas County Public Affairs Manager Tim Heider. Moreover, the county faced deficits as large as $17 million per year and had unsuccessfully tried to pass road maintenance taxes in the past. Starting in early 2016, Clackamas County officials crafted the fuel tax package in a transparent public process, with the board of county commissioners discussing and listening to public testimony about the tax in several town halls and public hearings, Heider says. Public turnout at the hearings and town halls varied, but Clackamas County also sought feedback and raised awareness of the tax through city partners, community planning organizations and a city-county summit on transportation. Results from a May 2016 county ballot item showed that 68 percent of voters thought the fuel tax would be an appropriate November ballot measure, Heider says. County commissioners also presented the tax issue to local chambers of commerce, community groups and “pretty much anybody that wanted to speak to them about this issue,” Heider says. People and organizations supported the tax, and Heider couldn’t name any organized opposition to the tax. Nevertheless, the tax measure failed in November, with 63 percent voting against and 37 percent voting in favor, per Heider and county data. Road funding continues to be a priority for Clackamas County, and Heider expects the issue to be addressed again within the year. Eilert, Hutchinson and Heider all admit that educating voters on the merits of a tax increase is difficult. But comprehensive education and citizen involvement can be invaluable to such a campaign. As a tax attorney, I usually am on the receiving end of an audit. Over the years, I have realized that while 90% of business is small business, a much smaller percentage of small business is compliant. Helping businesses stay compliant lowers the overall tax burden on everyone. As an example, misclassifying workers as “subcontractors” when the payor is the sole source of revenue for the payee, is not really a subcontractor when the sub has no separate tax ID # and is not “really” in business. In construction, worker’s comp is charged on subcontractors automatically, unless they can show proof of their own coverage, but the business itself could be funneling tax free money to the owner’s back pocket by alleging “cash payments” which are usually paid under the table to immigrants. When immigrants drain resources at City and County levels, the burden on the rest of us is higher when the payees are paid under the table. IRS Rules allow anyone in the world to have a tax ID # ‘ITIN’ by filing a W7. Forcing parents of school age children to obtain a tax ID # that allows them to be paid legitimately “over the table” would cause a decrease in the overall tax burden. I advocate for proactive worker misclassification audits, with a large side helping of amnesty, and a good dose of Department of Commerce, it was too close to election time to be doing widespread audits. It is just a leveling of the playing field for small businesses that actually do play fair. That is what compliance really is, playing fair.